Where do orphans live after the orphanage or trade school? Without job skills or housing connections, many land on the street or in exploitative situations – unless someone intervenes. Actually, many orphaned youth inherit village homes or apartments, a potential source of safe housing. But these are usually uninhabitable, with exposed wiring, walls or ceilings falling in, no running water, and other major safety issues. They look unsalvageable. But in God’s Kingdom, all things can be made new. In Last Bell’s Restoration Project, a crew of orphanage graduates renovates the homes of fellow orphans. We provide apprenticeship and mentoring. Crew members earn an income, learn marketable job skills, and restore their own communities. Like almost all our youth, Kiril Volinets comes from a deeply broken family. His mother went to prison, and his father abandoned him. He grew up in the orphanage system. 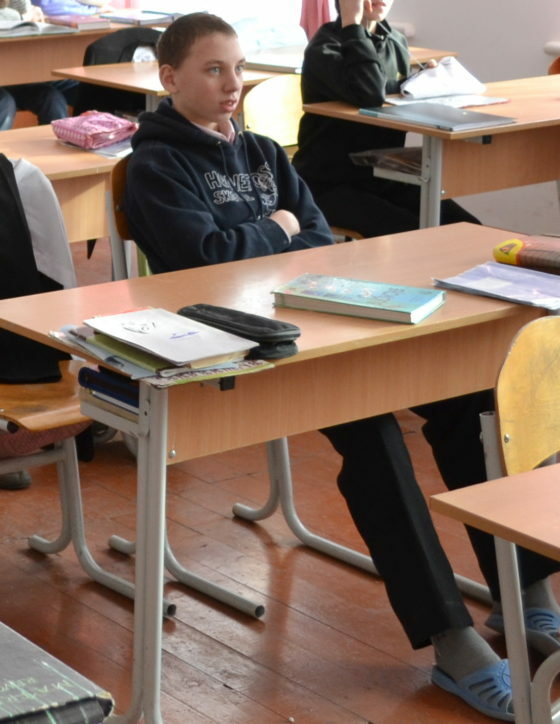 When Kiril was in 8th grade, Last Bell staff began to visit his orphanage and teach life skills lessons. 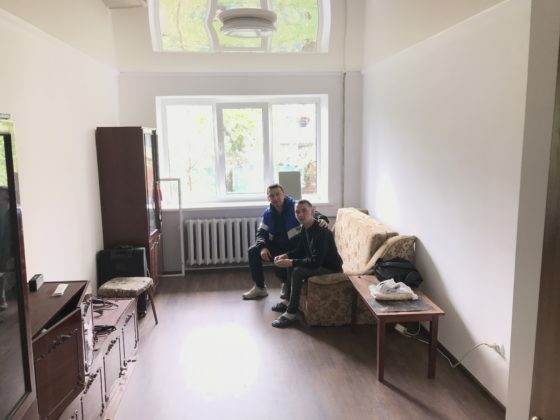 When Kiril and his classmates learned that Last Bell was going to renovate the Shelter and they would have a chance to live there, they pooled their resources to create and sell crafts to help with renovation. 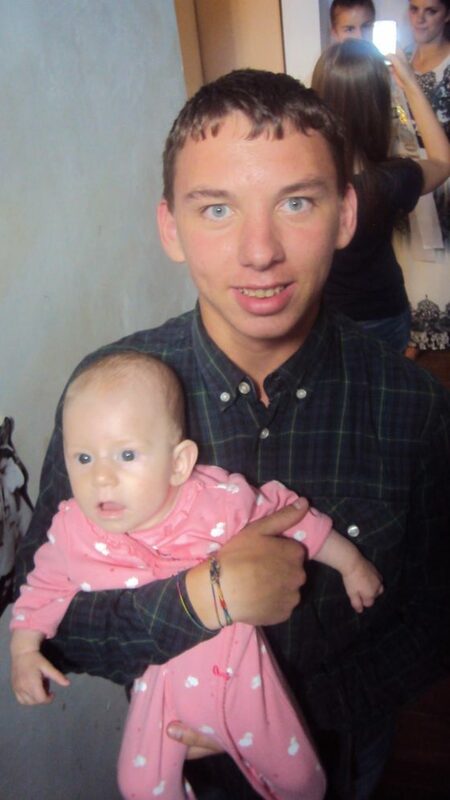 Kiril is a good student, a good friend, and early on began to volunteer with small children. He’s also a deep thinker, and used to keep the Shelter staff up late talking! Last Bell provided tuition funds so he could study at the pharmacological college in Zhytomyr. After attending Central Baptist Church for years, Kiril became a Christian, and was baptized in 2013. After Kiril “graduated” from the Shelter program, he moved in with his mom, who’d been released from prison. 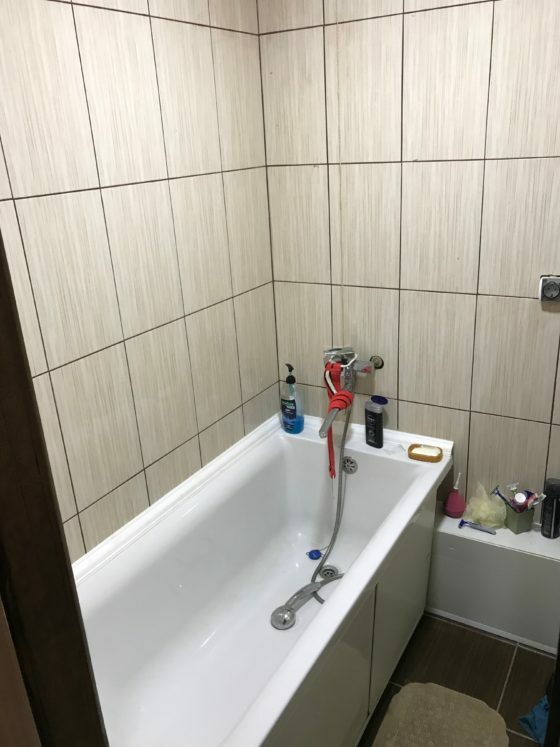 Director Andrey Pankyeyev shared, “In Ukraine, orphans often don’t have any option except to move into their old properties, with the parents who abandoned them years ago.” His mother is an alcoholic, and at first it was a difficult situation. But Kiril adjusted. With Last Bell’s help, he successfully graduated from college! His sister Vika moved into the same run-down apartment with her daughter Sophia. 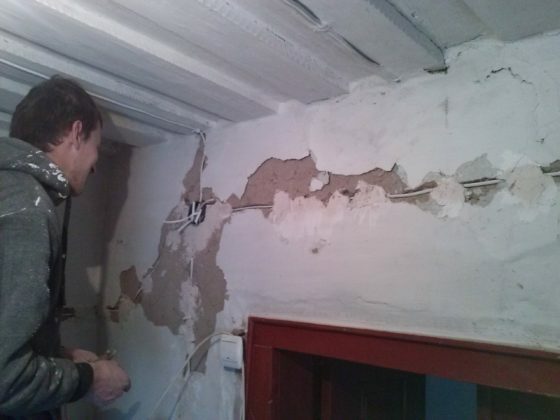 Kiril and Vika began renovating with their own funds. 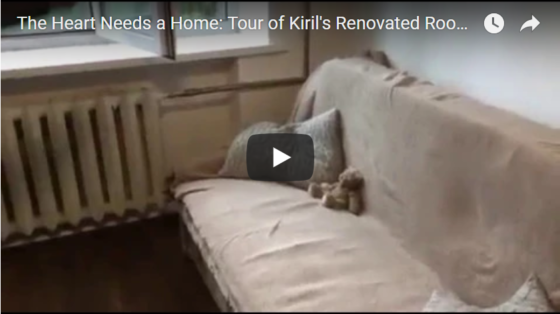 “We observed how Kiril and his sister had started to remodel [Vika’s] bedroom and the kitchen,” said Andrey. 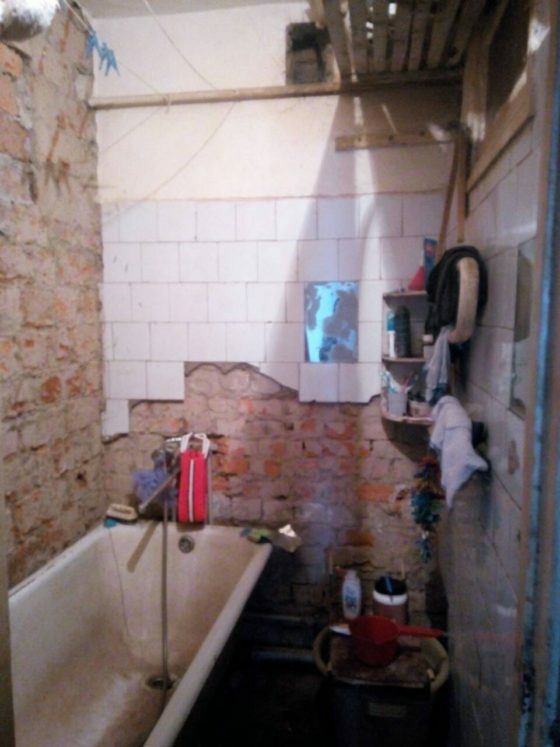 “They wanted to improve the terrible outlook of this apartment.” But Kiril ran out of funds before renovating his own room. Translation: This is the hallway. My room used to be the same, wires hanging. We’re planning to redesign the corridor one day and use plasterboards for the walls. And this is my room, a wonderful, beautiful room. There wasn’t a ceiling like this; there was an old one with cracks, and plaster was rusted to the head, and the corners of the room were rounded. Thanks to this organization, my room has changed. They made such a cozy room for me. It’s beautiful. I stay here with this dog. What’s left is the furniture that I was encouraged to redesign, repaint and arrange it beautifully. This is my sofa. It transforms into a bed, I sleep here. 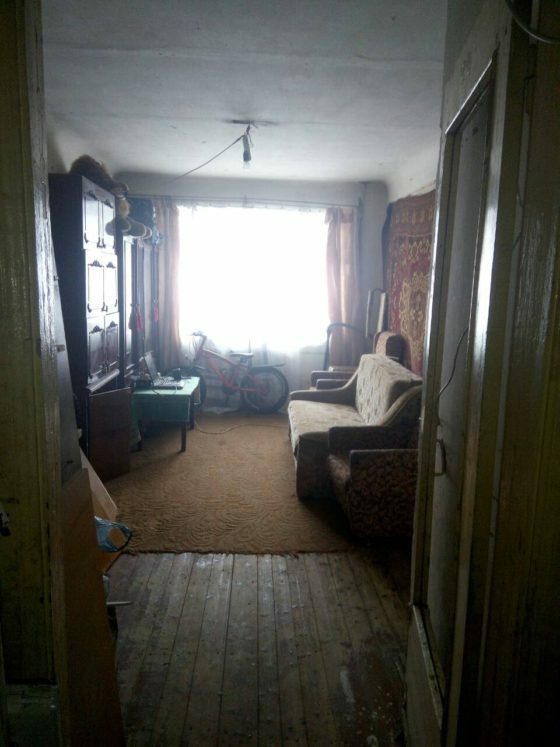 Before, a big table stood there, with a bedside table on it and an old sofa next to it. It was for me and my sister, we used to sleep in the same bed. Now I stay alone here. 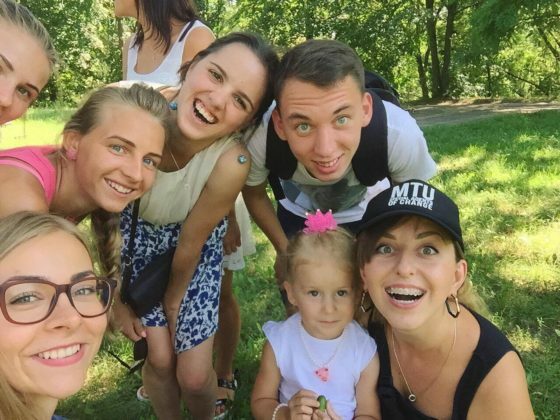 Right now, Vika is working in another country, and Kiril is taking care of his niece at the apartment. He’s changing his family’s path! Renovation projects like this help orphan-led families to stabilize, breaking the orphanage cycle. When orphans are safely housed, they can respond to the loving community that surrounds them and begin to heal. Restoration Project is not only restoring homes, it’s restoring lives!